Raise a Green Dog! : More pet shelters and rescues go green! More pet shelters and rescues go green! Not too long ago, my shelter (that is the shelter from where my Mum adopted me), the Southside Animal Shelter in Indianapolis, was awarded a 2 KW Solar Renewable system through a contest conducted by Johnson Melloh Solutions, a company that focuses on renewable energy products and services for their customers by offering offer Solar PV, Solar Thermal, Biomass, and Wind. This new system will reduce energy consumption and lower energy costs for years to come at the no-kill shelter. SSASI isn't the only shelter in the country concentrating on being more green and eco-friendly. Just recently the Chicago-based Harmony House for Cats unveiled its new eco-friendly shelter, the first Net-Zero Energy building in the Chicago area. Powered by 14 geothermal wells, 20 solar thermal panels, and 96 photovoltaic panels, the amount of energy created on location will be more than the building will use in a year. In addition, the 7,086 square feet location now has motion light sensors and temperature-regulated cooling and heating units in every room. The shelter also has a fully landscaped courtyard, that allows for full natural light to shine in and enjoyed by the cats as they wait for their furever home. Back in 2009, we sharee info with you about a new eco-friendly shelter in Silicon Valley. The Humane Society of Silicon Valley, opened on Saturday Mar. 28, 2009, to show off its new green, cageless, homelike habitat in Milpitas for strays that it's calling an Animal Community Center. The new center includes solar heating and a water-efficient kennel cleansing system. 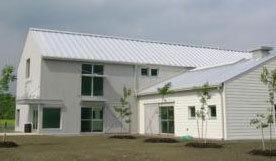 In 2005, the Tompkins County SPCA in central New York led the way in becoming the first shelter to earn a silver LEED rating (Leadership in Energy and Environmental Design). And it's no surprise that Tompkins County became the first No Kill community in U.S. history in 2001/2002. The green, eco-friendly lifestyle works very well, and hand-in-hand, with the no-kill movement. These aren't the only shelters taking the green, eco-friendly route. In 2011, the city of Denver utilizing a $17 million bond — $10.5 million of which was for construction — paid for a brand new shelter. At just less than 36,000 square feet, it is nearly triple the size of the old structure. The new Denver Animal Shelter includes a variety of green features that may help the facility be certified with a LEED Platinum rating; including skylights for natural light, radiant heated floors, evaporate cooling, a recovery ventilation system and more. Other eco-friendly shelters are in Florida, Texas, Wisconsin, and Rhode Island. Reducing costs that free up funds that can be redirected in saving more four legged lives. Developing more life-like, realistic environments for dogs and cats, through more natural light, greener spaces and fresher air. Creating a healthier, less toxic environment. All of these benefits are designed to make a huge impact on the demeanor and health of the pets, increasing their chances of adoption, as well as reducing the effect on the environment..
One of the most effective ways you can help your local shelter be more green is to donate greener materials that they need and want, including items such as CFL/LED light bulbs, rags and towels (instead of paper towels), greener and healthier cleaning products and supplies and more. Seek out on behalf of your shelter any community grants, corporate donations and/or fundraising efforts that may be able to provide fresher air exchange systems, solar energy, and more energy efficient appliances. Donate your time to maintain (or help build) the shelter's green spaces utilizing organic and natural fertilizers. Pull weeds, replant bare areas with un-coated grass seed, fertilize with organic product and more. And while you're there take the time to take a few dogs for a nice walk. Provide funds or donations, or fundraising opportunities to provide the shelter with more eco-friendly, healthier pet foods and cat litter supplies. Help the shelter institute a recycle, reuse program to cut back on waste. We are very happy and proud to see so many shelters devote their time and efforts to being more green and eco-friendly, as well as create more life-like and healthier environments for dogs and cats (and other animals) looking for their furever home! Photos courtesy of Southside Animal Shelter, Inc., Earth911, Tompkins County SPCA, Harmony House for Cats. Go green dog. 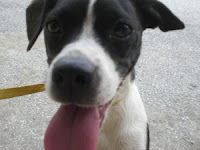 I am happy that there can be a green home for dogs to let them live happily. 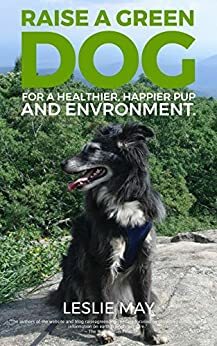 I just own a jack russel terrier lately and since I imbibe the whole Eco-friendly and green living, I am so glad I can find a lot of posts here that can make me raise my dog according to our lifestyle. Thanks!